This effect uses the first three nodes of a path to define a two dimension grid. The center node defines the origin, the first and third nodes define the direction and length of the two adjacent sides of the first cell. If a path has more than three nodes, the other nodes are ignored. One can select the number of cells in the two orthogonal directions. Demonstration of the Construct Grid effect. 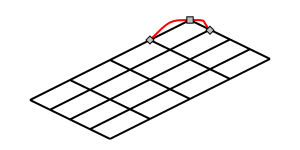 A three node path (red line) determines the grid. The X and Y sizes have been set to four.